Squeeze half a lemon. Chop the parsley. Heat the butter in a pan on a low fire and cook the shallots in it for a few minutes. Add the mushrooms, lemon, salt and pepper. Cook for 5 minutes, stirring regularly. As soon as the mushrooms are cooked, pour the water, the beef stock and 10 cl of cream. Cook on a medium fire for 15 minutes. Season, then pour everything in the food processor and process for a few seconds. Pour everything back in the pan. Mix the maïsena (or flour) in ½ a glass of cold water. Pour on the velouté, mix well. Beat the cream and egg yolk in a bowl. Away from fire pour the velouté, whip and sprinkle with parsley. Serve with croutons and grated cheese. In a pan, infuse the thyme and laurel in 30 cl of hot water for a few minutes. Season. Pour boiling water on the couscous. Cook it for 15 minutes, then keep it aside. Cut the peppers in small dices. Season the seabass fillets. Pre-heat the oven at 150° (th. 5). Quickly pan-fry the dices of peppers in olive oil for 4 minutes. Keep them aside. In another frying pan, cook the fish fillets in olive oil for 2 to 3 minutes, turning them gently with a spatula until they get golden. Put them in a cooking dish. Sprinkle the fish with the pepper dices and sesame seeds. Put in the oven at 150° (th. 5) during 3 minutes. Place each fish fillet on a bed of couscous previously seasoned with Xeres vinegar and dressing. Serve immediately. Leave the Vacherin cheese in its packaging. Protect its box with foil that you fold towards the inside of the box (wood burns!). In the cheese rind, make 4 holes of 1 cm in diametre and 2 cm in depth. Put it in an oven dish. Place garlic cloves in the holes. Add the shallot and cover the rind with 4 thin slices of tomato. Then pour the white wine of the Vacherin cheese until it is absorbed. 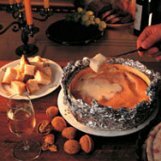 Place the cheese in the oven for about 20 minutes until it is golden and melted. Served with potatoes and/or brand, along with lamb’s lettuce. In a frying plan, grill the split almonds. 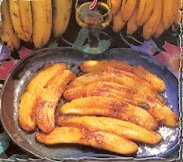 Peal the bananas, cut them in 2 and cook them with butter and brown sugar. Pour the cognac, flame and pour the orange juice. Sprinkle the grilled almonds then serve.